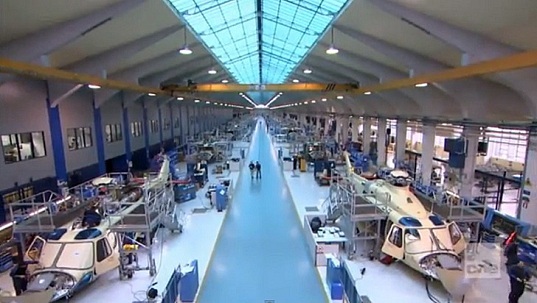 The world’s first electric tilt-rotor aircraft has been unveiled by Anglo-Italian helicopter company AgustaWestland. The prototype—called Project Zero—features advanced tilt rotor technology that allows it to hover like a helicopter and perform forward flight like an airplane. Two integrated rotors are horizontal during vertical lift and can be rotated 90 degrees during cruise flight. While the previous versions of the tilt rotor aircraft, the AW609 and V-22 Osprey, had engines mounted at each end of their wings, Project Zero has integrated rotors powered by rechargeable batteries and can change position depending on the operating mode. When on the ground, the aircraft’s rotors can be tilted in the direction of the prevailing wind and enable the recharging of its batteries. All of the aircraft control systems, flight control and landing gear actuators are electrically powered, removing the need for any hydraulic system. The aircraft is designed with detachable outer wings for missions performed primarily in helicopter mode. Thanks to low levels of thermal signature, Project Zero doesn’t require oxygen which means it can fly at altitude or in heavily polluted conditions, such as volcanic eruptions. 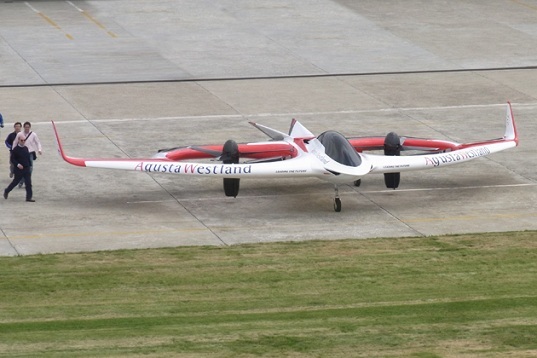 The aircraft performed its first unmanned flight in June 2011 at AgustaWestland’s facility in Italy, followed by several untethered hovering test flights.